A generous serving of deep fried shrimp. Includes French fries or steamed vegetables and a choice of cole slaw, a cup of soup or salad. The best catch of the day! Cod filets, deep fried golden brown. 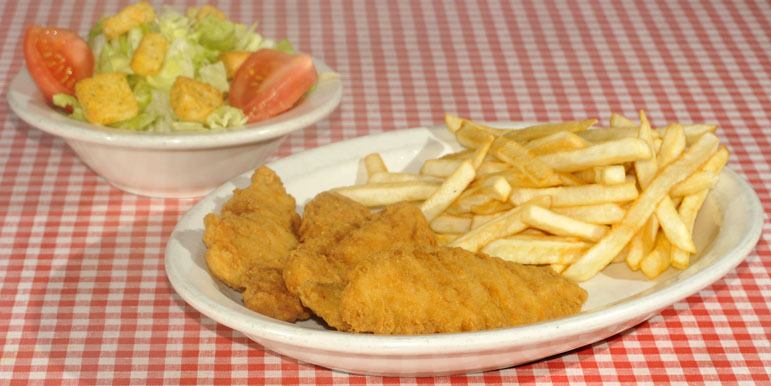 Includes French fries or steamed vegetables and a choice of cole slaw, a cup of soup or salad. No bones about it, these natural chicken breasts are tender and delicious. Includes French fries or steamed vegetables and a choice of cole slaw, a cup of soup or salad. Complete your meal by adding soup and salad bar for only $2.99 more. No sharing please.